The Nigerian German writer and performer Olumide Popoola is part of a burgeoning African German cultural scene. As a poet she weaves her different voices into complex, politically charged spoken-word performances. Her deliverance is inspired by different forms of expression such as Hip Hop, Jazz Poetry and African story telling traditions. In Germany she is known especially in connection to the anthology ‘Talking Home. Heimat aus unserer eigenen Feder. Frauen of Color in Deutschland' which she edited with Beldan Sezen (blue moon press, Amsterdam 1999). 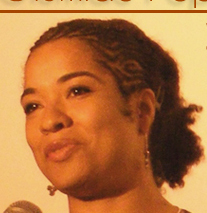 In 2004 Olumide Popoola won the May Ayim Prize for Poetry, the first International Black German Literary Award. Her work has been published in magazines, newspapers and anthologies since 1988 in Germany, Slovenia, South Africa and Nigeria. She holds a BSc in Ayurvedic Medicine, a MA in creative writing and will continue her academic education with a practice-based PhD programme in creative writing.